I usually avoid getting involved in Singapore Athletics’ selection criteria for any major games and refrain from publicly confronting another Singaporean athlete. However, in light of the recent interviews given by marathoner Soh Rui Yong with regards to the wild card selection criteria for the Olympics and other athletes in contention, I feel the need to speak up and share my thoughts as a fellow national athlete on this issue. I set out below several statements which the press had quoted from Rui Yong’s interview. The selection criteria adopted by Singapore Athletics may not be perfect, but it was discussed and decided upon more than 6 months ago and made known to all athletes and the public. Athletes have been working hard to qualify based on these criteria. Poking holes at the criteria just 6 weeks before the games, is hardly the best time and perhaps a more opportune time would be to do so during the post-games. I feel that Singapore Athletics has been extremely supportive of all our racing endeavours for the past 4 years especially for those who were chasing the Olympic dream. Though there may be some issues which could be better managed, I think overall it has been a good job done by the association. I am sure they will continue to work on it and improve the process. Rui Yong has great potential in distance running. However, no matter how well he or any other athlete is performing, I firmly believe it does not give them the right to belittle the achievements of others and judge their potential. Both Edmund Sim (national race walker) and Ang Cheng Xiang (National hurdler) have brought their respective disciplines to a level previously unattained by any Singaporean by setting new national records within the past year. With the experience of racing at the Olympics, it might just be the spark needed to bring them to the next level. Instead of playing down the performances of other athletes, we should always look to support our fellow national athletes and at the same time, use them as an inspiration to drive ourselves to greater heights. Rui Yong – “There should be a better criteria. It is not holistic — only considering one factor which is national records, but not (performance at) major competitions, or which athletes go closest to the (Olympic) standards,” said the marathoner, whose personal best of 2:26.01 is still shy of the 2:19 needed to qualify. It is true that solely taking into account a national record without considering how close the athlete is to the Olympic qualifying mark does not make the selection criteria a “holistic” one. Going with Rui Yong’s suggestion may make it more holistic, but even that does not put him ahead as the best candidate given the circumstances under which he ran his personal best of 2hr 26min 01sec. Firstly, this race which Rui Yong completed in December 2014 lies outside the Olympic qualifying window of 1st January 2015 to 11 July 2016 as stipulated by the International Association of Athletics Federations, IAAF. Secondly, this time was clocked on a downhill course which is ineligible for consideration of an Olympic spot. To those who are unfamiliar with marathon running, the International Association of Athletics Federations has rules which detail what is required in a marathon course in order for the times clocked in that particular marathon course to be eligible for official national records and Olympic qualification. The California International Marathon in which Rui Yong ran in December 2014, and clocked his personal best of 2:26:01 was not a marathon course which was considered as “legal” in accordance with the IAAF rules. In order for a marathon course to be “legal” and for the times clocked in that marathon to be eligible for national records or Olympic qualification, the IAAF rules state that the elevation drop of the marathon course has to be less than 1m per km (http://aimsworldrunning.org/IAAF_rule_260.28.htm). 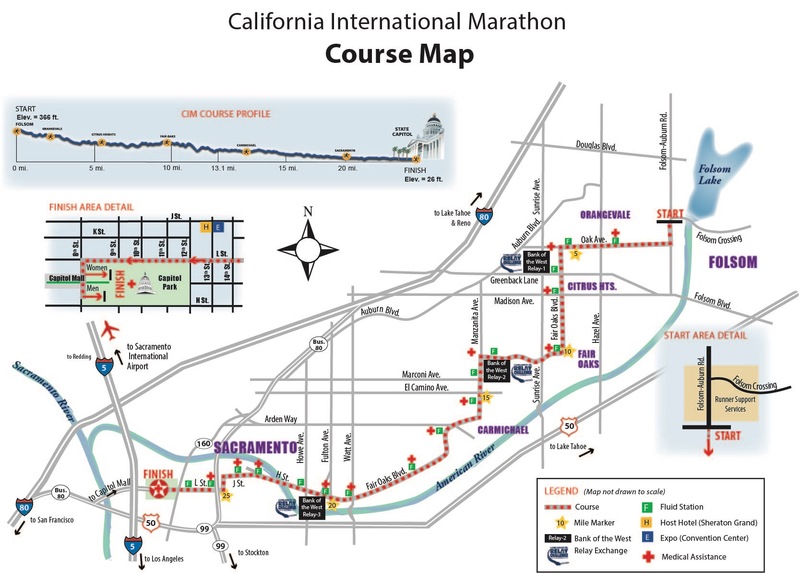 The California International Marathon, however, had an elevation drop of 103m for the entire marathon (refer to the course map above), which works out to be 2.45m per km. To better understand the advantage of running a downhill marathon, just ask yourself if you prefer running uphill or downhill and you will easily understand the impact of such a marathon course. I feel that it is also important to clarify this issue as this result has also often been regarded as the second fastest marathon ever run by a Singaporean in history, which is not entirely accurate. Therefore, his personal best should not come under consideration for the wildcard selection for the marathon event for the above reasons. Instead his time of 2:34.56 set in June 2015 should be used and that would put him as the 3rd fastest marathon runner, behind Ashley (2:32.12) and myself (2:27.02) within the qualifying period. In essence, Rui Yong’s official best time on a “legal” marathon course is no closer to the Olympic standard than many other Singaporean Athletes in contrast to what he suggests. Statements like the above are inaccurate but I would like to believe that Rui Yong has been misquoted. The athlete chosen to represent Singapore at the Olympics should most importantly be injury-free and able to produce his best performance on the race day at the Olympics. Rui Yong says that he was finally able to run pain-free only 3 days ago and he does not want to risk his injury flaring up by running the Gold Coast marathon in July. Yet, he asks that Singapore Athletics take a gamble in hope that he will be fully recovered and ready to perform at the Olympics in August. I do not think this would be fair to the other athletes who have gone through alot to make sure they are in tip-top shape all year round. 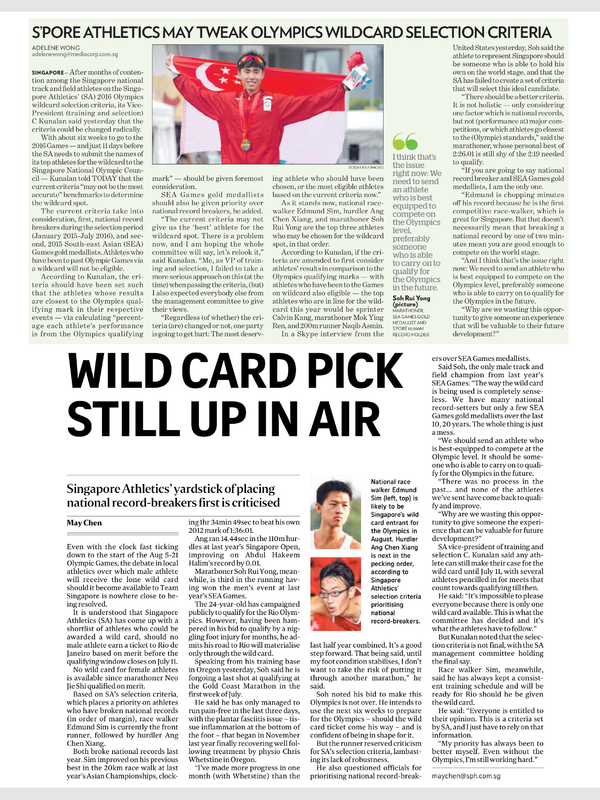 Making a wild card selection is never easy for Singapore Athletics given the pool of athletes across very different disciplines. As athletes vie for this spot, it is important to ensure transparency of information and uphold sportsmanship throughout the selection process. Rui Yong has always been a strong and brave contender in the marathon and he has my utmost respect in this aspect. I strongly believe that with his talent and tenacity, he has the potential to go very far in this event and push it to the next level. However i feel that everyone deserves a chance to prove themselves, whether it the Singapore Athletics or other national athletes; and we Singaporeans should always look to be constructive and supportive of their endeavours. Soh Ruiyong is sadly 走火入魔. Somebody save him, what are his parents doing? 1) just because a criteria was determined 6 months ago doesn’t mean it shouldn’t be changed. Thats like you saying “I made a mistake 6 months ago but now I’m scared to readdress it so let’s just let it get bigger”. Mr Kunalan has acknowledged that this criteria is a mistake. If something is wrong, it has to be corrected. Plain and simple. 2) I never played down the achievements of Edmund or Chen Xiang. I simply said that breaking national records alone doesn’t mean you are the best choice for the wild card because some records are harder/softer than others. And I already foresaw that people like you would try and use this to turn us against each other, so I spoke to them before talking to the media and let them know what I really thought just in case I was misquoted. 3) The California International Marathon is a USATF certified course and I had checked with SA before attempting it as a sea games qualifier. They understand it as such: it can be used for qualification for major games but will not be used as a record eligible course (I have the email for this). By the way our national record of 2:24:22 is still not yet verified as a record eligible course. Then you go on to say I would have been misquoted which is not true – I did say that. I broken a NR (half Marathon) and won the sea games within the window. So you are picking and choosing your facts and twisting them against me. I dunno what you’re getting at. As someone who has previously publicly insinuated that athletes go to Kenya to dope (when you knew I was in Kenya! ), you are the last person that should be trying to lecture others on respecting the achievements of other athletes. I agree with you and I have an idea which is to ask the government to pass a law whereby all sporting associations – all sports – must hold their own competitions – twice at least – and only select the winners to represent any national, regional, international competitions. As I am a nobody, my voice cannot be heard but you, being who you are, may have the network and status to voice out such a suggestion – if you agree with it and get them to implement it. I only half agree with you on the ‘6 month’ mistake made by C kunalan. SNOC deadline is 3rd July, and end of Rio olympics is 22nd August, the date where supposed redress for future olympic qualification campaigns can be kickstarted! Between 3rd July and 22nd August, I dun think the mistake can get any bigger, if ever at all in the first place! No matter who we send, not 100% of athletes can be fully satisfied or pleasured, and so by virtue of that alone will ALWAYS be a mistake no matter who we send, as well as, no matter how good the selection criterias are—-since no criterias can ever be perfect, or all encompassing! So it is only honorable and reliable of a fellow human being like C Kunalan to NOT go back on his ‘flawed’ criterias because athletes worked in training with an expectation of this ‘flawed’ criterias at the back of their minds! Does that make sense to you? The flawed criteria should be followed through all the way to the end of the Rio olympics, provided 1) no professional, ethical or moral boundary has been broken! Looking at the criterias which C kunalan set out, he views national record holders more favorably over some other factors, so if you called this ‘flawed’ criteria, yet this ‘flawed’ criteria doesn’t break any professional, ethical or moral boundaries, and it should not be an issue whether to follow through with this ‘flawed’ criteria all the way till the end of Rio. Let’s try another angle: supposing the criteria set out by C Kunalan explicitly states that only national record holders who are concurrently WELL KNOWN PIMPS AND GIGOLOS will be considered for Rio olympics, then thank goodness, we have a ‘flawed’ criteria that has broken PRPOFESSIONAL, ETHICAL AND MORAL BOUNDARIES!!! Does that make sense to you? If not, you should seek out less narrow-minded ways from more open-minded and mature people around you. I am no defending Mok right here, but wherever I see an ethical and moral infraction, I have no qualms about throwing it straight at your face! I think you are the one for which we should be asking “what the heck are you getting at!?!”. If you think I am trolling you, or any of your so called ‘friends’ think I am trolling you, why don’t you first consult around with your parents to see if any of what I say here makes just one percent of sense! Trolls are 100 percent nonsense, so if your parents can grant that there is 1 percent of truth in what I say, I suspect you should apologize big time to Mok and many other people whom you’ve flamed online over the past 5 months. Mok claims you belittled Edmund and Ang because of non-verbals, my dear friend! Didn’t you learn in the university of oregon what good communication skills resemble? 70 percent of communication is non-verbal—such as tone, register, and, language expression?! Your quotes stink of a certain non-verbal arrogance that can be detected within your charge-ion field!!! And it’s not me alone who detects, just ask around all the coaches and officials of sport singapore and the associations. Your arrogance is so overarching that even those of(your supposed close ‘friends’) who claim they can’t detect this arrogance from you probably 1)didn’t dare admit it to you because they have been totally blind-sided by such never-before-seen arrogance 2) are equally if not more arrogant than you are. Does this make any sense, my dear friend? You know you can’t find no fault with me—-that is a lost cause, my dear friend. You know what I say amounts very close to, if not, the complete truth. Do you need me to personally contact sport singapore about your increasingly unbecoming behavior in the social media sphere, and harrassing and name-shaming a bunch of innocent no-namers and bystanders who only have the BETTER INTENTIONS than all the rest of your so called ‘friends and coaches’?!?!! And finally, are you still going to insist your downhill california marathon course time of 2:26:01 is not really indicative of your true personal best? Are you first going to address this to your world-wide audience and tell them honestly, in all humility, you only really ran perhaps no faster than 2:27:30 on that fine day in december 2014?! Frankly, Soh Ruiyong, we are sick of all your boasting. We just wanna hear for once in one of your posts in the future, of you giving up your privileges and rights so that somebody else may reap that benefit in your place? We don’t want to hear anymore about go-getting, and go-getting done terribly/poorly and without respect and honor, we wanna hear about you letting it go! You heard that right! Soh Rui yong, perhaps we can ask, is the Olympic qualifying standards flawed? Since u can’t make it on merit. You might have heard of his insistence on his facebook page and blog that barring the plantar injury, he was sure(i assume 90 percent) that he would run under 2:19:00 to qualify for Rio outright. Now given our stand on the matter above, I can tell you, William, that we are BEYOND BEWILDERED by that proclamation to the world! You must understand that for us people, the ones with so called knowledge and expertise(not boasting here), that is a complete and outright LIE of the highest order. It’s like a CCTV caught your face shooting an innocent cashier in a robbery and you turn up in court and denied the evidence a hundred times out of hundred!!! For the normal layman, or normal or semi-serious runner in Singapore or otherwise, with average or even good knowledge of distance running, it would have been, I guessed, understandably hard for him/her to understand just where I am coming from, and why I completely insist, 99.9%, that no amount of hard/smart training was ever going to propel Soh Ruiyong to a time under 2:19:00 IN ANY AMOUNT OF TIME. The explanations for why I have such views have been painstakingly and critically explained in the 17 blogposts of my blog! I urge all leaders in office in their respective associations or ministries to peruse my blog and immerse themselves in that sea of critical thought, again and again. FYI, just to show you how, in my view, blatantly deceitful and misleading Soh Ruiyong’s Rio marketing campaign had been all this while, I entreat you, William, to take special note of South-east Asia’s best and one of the most legendary distance runner ever—–Agus Prayogo. This man has a personal best for the 10000m almost 2 minutes faster than Soh Ruiyong. 31:15 and 29:25 are times astronomically far apart, much like different galaxies! To the normal lay person, or average distance runner with average or sometimes even very good distance knowledge, it may seem like a mere 2minutes that should ordinarily be easy to transcend, as perhaps a shortly timed walk from your door to a supermarket across the street. I shall now bring my knowledge and expertise to bear on this seeming pittance of a time difference: at the speeds which athletes employ to run a 29:20 10000m, 2minutes of such an effort normally covers around 700m of ground, which amounts to about 1.75 laps or so. Well-trained athletes all over the world about the standard and age of Soh Ruiyong are looking to improve tens of metres every year, through ethical and moral(honest) means of training. But Soh Ruiyong is looking to improve not even a hundred metres, BUT HUNDREDS UPON HUNDREDS OF METRES like the generous deluge of the Niagara falls, in virtually comparatively non-existent(read zero) time, AFTER ALREADY having made close to such a magnitude(or deluge) of improvement with his drop from 32:26 to 31:15, if you remembered and followed his career trajectory!!! That just doesn’t happen unless ethical and moral rules of the sport has been broken. I am beyond sure about that, which is why you see me writing blogposts and analyzing information with respect to Soh Ruiyong in such a passionate and rigorous manner! For why would I do such a thing if I weren’t beyond sure about my appraisal of him?! Does that make sense? I am inclined to even believe that Soh Ruiyong is not that dumb to think he actually even has a 1 percent shot of making the Rio olympics, and I would rather instead believe that—–he actually knows he is conspiring an outright lie to the world for reasons ONLY HE KNOWS WHY. Everything happens for a reason, and even in unreasonableness exists reason. You should have a heart-to-heart talk with Soh Ruiyong personally and maybe then you will get a clearer idea of why! Just saying…….. They are very valid points. Joe you should continue writing that blog. It will help alot of people. Thanks William, I appreciate your interest in my blog, but we would like to give this man Soh Ruiyong, time and space to resurrect his career. We don’t want him to finally say that all his failures can be attributed to terrible ‘background noise’ or ‘anti-SRY’ sentiments/analysis in the form of my blog, because that would indeed be a legitimate excuse, and I would be forever personally guilt-ridden. It might also be true that writing the blog would help a ton of people, but these tons of people’s running careers/hobbies are not as high-stakes as Soh Ruiyong’s, so therefore I believe the overall utility attributed to helping alot of people will not far exceed the seemingly negatiive influence or ‘anti-SRY’ effect on Soh Ruiyong’s career.